If you are a nostalgic person, this article is quite perfect for you. So, have you noticed how I put “Perfect” and some kind of talk about the past in this sentence above? Well, apart from real quality introductions, this article on language-easy.org we try to explain all you have to know about a essential part of German grammar, the German perfect tense. Unfortunately, especially this tense is of high importance. So, you won’t be able to skip this topic as you will need it to master German. 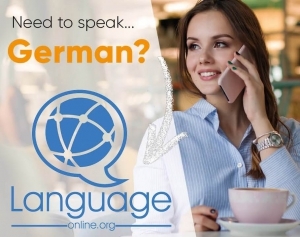 Well, you simply need it to express past situations and so make your German fluent! Although German tenses confront you with a lot of irregular verbs, you will see that there are huge parts of regular verbs and clear rules that make it easy to master this part of German grammar. Well, let’s go straight to the most important part of this article. In the following, we will have a look on way you have to form the perfect tense and specify its use. Auf geht’s! What is the German Perfect Tense? Was ist das deutsche Perfekt? First of all, we should clear up what we are actually talking about! So, there are some parallels between the German perfect tense and the English perfect tense. Well, the English present perfect tense refers to an event that happened in the past but continues (or, well, maybe continues) in the present. I ate two pizzas today. I have eaten two pizzas today. There is no such perfect tense in German! Both tenses use an auxiliary verb and they also use a past participle. However, the way of using the German perfect tense is quite different to the English present perfect tense. On the one hand side, “das Perfekt” refers to a past event or action which has been completed. On the other hand side, this German perfect tense in the tense you mostly use in conversations. By the way, that’s why this language is of such a high importance to make your German fluent. Das Formen und Benutzen des deutschen Perfekt. Finally, we have reached the most important part of this article about German perfect tense. Here, we will have a look on how to form the German tense and, of course, how to use it. Please, don’t be too sad by now. For sure, it will be far easier for you as you might think. Well, as we have already cleared up the upper section of this text, you need an auxiliary verb to form German perfect tense. So, there are two auxiliary verbs you can use, depending on the context of the verb. So, I am talking about forms of “haben” and “sein” in the present tense. By the way, there in another article about to conjugation of “haben” and “sein”. First, the forms of “haben” are the most common ones you normally use to form the German perfect tense. Well, just keep that in mind when you form this tense. Second, the forms “sein” are used when you have expression with verbs of movement. Furthermore, you use forms of “sein” with verbs of changing conditions. For example, “sterben” (to die) is one of these verbs. So, there are only two important exceptions from these rules. Well, the verbs “bleiben” (to stay” and “sein” (to be) both use “sein” as a auxiliary verb when formed in the German perfect tense. So, the second element you need to form the German perfect tense is the past participle of your main verb. Actually, it’s really simple. First, you just have to add the prefix ge- to the beginning of your infinitive verb. After that, you cut off -en from the end of the verb. Finally, you add -t instead of -en. “kaufen” (to buy) – “gekauft” – “Ich habe Pizza gekauft.” – I have bought Pizza. “beten” (to pray) – “gebetet” – “Ich habe um dich gebetet.” – I have prayed for you. From this example sentence, you can see that the auxiliary verb always goes in the second position, as is always the case with the TeKaMoLo rule (Temporal, Kausal, Modal, Lokal—the rule that governs the order of adverbial phrases in a sentence). The only exception to this rule would be a sentence with a subordinating conjunction such as weil (because), which would send the verb to the end. Please, keep in mind that strong verbs are actually strong verbs because they an irregular past participle form. Furthermore, when converting mixed verbs into their past participle forms, you change their stem. Well, you might ask yourself why I just mention that point in a short paragraph. But, you simply have to learn these exceptions by heart, there is no rule that could help you. 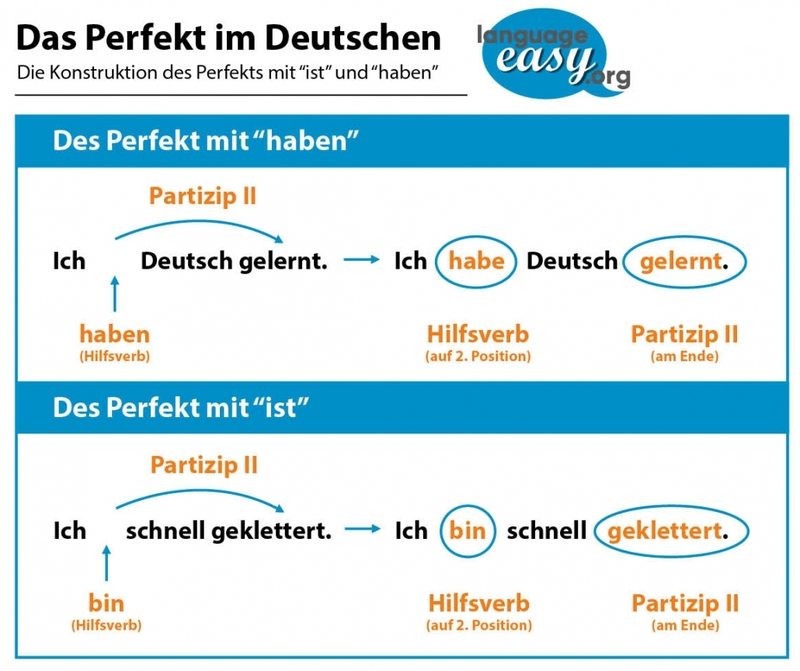 Finally, there are only some factors you should know to master German perfect tense left. First, you should know how to form the past participle of separable verbs. As the name implies, separable verbs are verbs with separable prefixes at the beginning that change the definition of the stem verb. Do your best to memorize as many of these as possible, but remember, there’s always a dictionary or an app at your disposal if you get stuck! Hopefully, you have learned some new things about German perfect tense – their different ways of forming it and, of course, the correct use of this tense. Unfortunately, there are a lot of exceptions, especially in the German participle forms. Well, that’s something typical of German – you simply have to study, study, study. But try to think in possibilities German opens you: The country, the people and their culture. By the way, there is a good article on Wikipedia about German verbs and also there are some list of irregular ones.